Duncan Jones' soulful sci-fi journey has been a passion project for the director for many years so imagine how excited we are that Netflix exists to allow his vision to become a reality. Duncan Jones has been a consistently interesting filmmaker between his breakout, Moon then Source Code and the high fantasy epic Warcraft. Here her presents a world of strange currencies in which echoes of love and humanity are still worth listening to. Berlin, the future, but close enough to feel familiar: In this loud, often brutal city, Leo (Alexander Skarsgård) - unable to speak from a childhood accident - searches for his missing girlfriend, the love of his life, his salvation, through dark streets, frenzied plazas, and the full spectrum of the cities shadow-dwellers. As he seeks answers, Leo finds himself mixed up with Cactus Bill (Paul Rudd) and Duck (Justin Theroux), a pair of irreverent US army surgeons on a mission all their own. 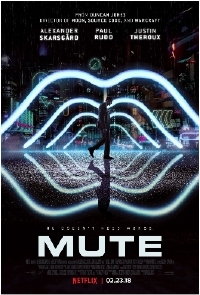 Mute is co-written by Jones and Michael Robert Johnson. The film is produced by Stuart Fenegan. Charles J.D. Schissel and Trevor Beattie are executive producers. Mute hits Netflix, February 23, 2018.